Digi’s expansion of its LTE-A (Cat. 6) efforts in Malaysia, with the introduction of two new mobile broadband plans. These plans take advantage of the deployment of LTE-A in the Klang Valley, and offer a substantial data cap – with a catch. 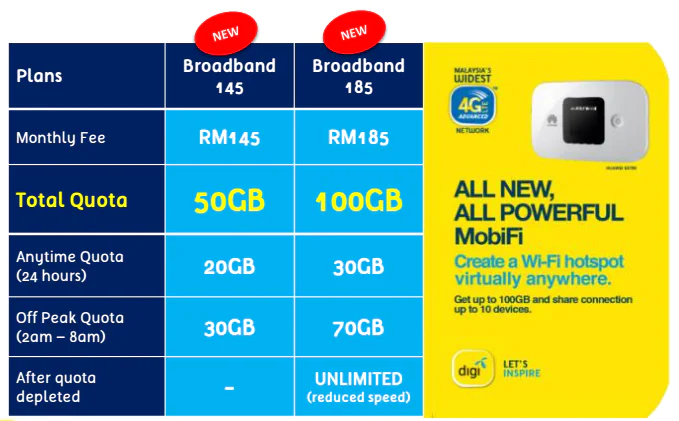 Digi Broadband 145, as the name suggests, has a monthly commitment fee of RM145 and comes with 50GB of data. However, the 50GB data quota is split into 20GB and 30GB – the first quota can be used at any time, while the the other 30GB is only usable during off-peak hours (2am – 8am). Once the quota is fully utilised, the user can purchase additional add-on data quota or be cut off from the internet. 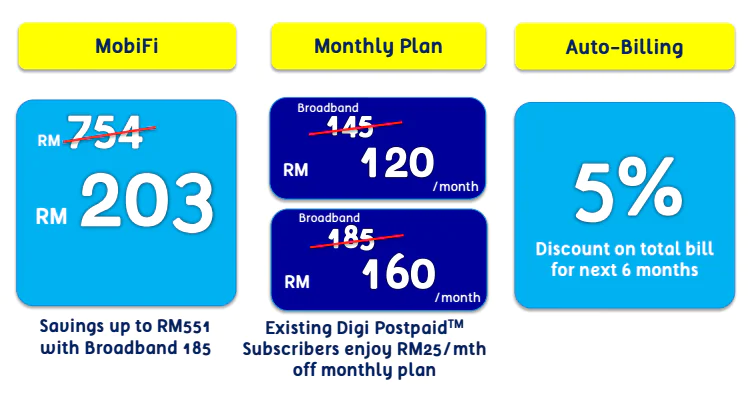 On the other hand, Digi’s Broadband 185 plan is priced at RM185 a month and offers a data cap of 100GB a month. The quota will also be split into 30GB anytime quota and 70GB only usable during off-peak hours. Customers will still be able to connect to the Internet once the quota is met, albeit at a lowered speed (512kbps). To accommodate Digi’s LTE-A (Cat. 6) network, the telco also unveiled its latest mobile Wi-Fi device – the MobiFi. The device is actually a Huawei E5786 modem, which is capable of creating a Wi-Fi ac connection and share Internet with up to 10 users or devices. All this while running on a 3,000mAh battery built-in. Existing Digi customers get to save more as the MobiFi will be sold at a discounted price of RM203 and RM25 off the monthly commitment fee for the mobile data plans. Customers will also get an extra 5% discount on the total bill for six months for opting for the auto-billing option. Digi promises to deliver more than 10mbps speeds for more than 80% of the time with its latest Broadband 145 and 185 plans. To learn more about the plans or the MobiFi device, head on to Digi’s official website here.